Nottingham Rugby is delighted to confirm that Little Ruggers will return this summer both at Lady Bay and Southwell Rugby Club. This year, there will be two Little Ruggers programmes running every Saturday from 4 May to 20 July at The Bay (9:15am – 10am) and Southwell Rugby Club (11am-11:45am). Teaching children aged two to five the fundamentals of rugby in a fun, accessible and friendly way, the incredibly popular programme has been designed by the elite coaching team at the Championship rugby club and is delivered by professionally trained coaches. Nottingham Rugby Head Coach, Neil Fowkes, said: “Little Ruggers is a fantastic example of the Green and Whites’ devotion to creating a family-friendly rugby club. “We pride ourselves on our community and it is at its best when people of all ages are taking part in the sport one way or another. Steve Smith, Chief Operating Officer at Nottingham Rugby, said: “Little Ruggers has been incredibly popular over the past few years and we are expecting the same high turn out again. 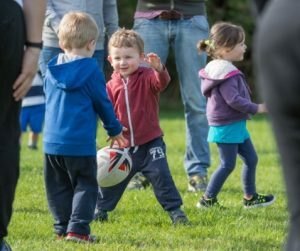 “We believe that rugby is a family orientated sport and it’s great to see parents and their children learning the fundamental skills of the sport together. Little Ruggers costs just £2 per session, with parents able to pre-book their slot via this form or calling 0115 907 0070. Parents can also turn up and pay on the day too. Please do not hesitate to get in touch if you have any questions regarding Little Ruggers or if you would like Nottingham Rugby to host sessions at your club.